At NAB 2018 Avid announced a comprehensive line-up of video and audio software that empowers creative professionals and aspiring artists alike. Whether you’re recording, mixing or editing, you can create at the speed of inspiration using the tools embraced by the industry. Now, there are products for everyone—and they’re more affordable than ever. Avid have expanded and aligned their creative software brands to make it easier to understand the product tiers and grow within the family as you develop your skills and career. The popular entry-level “First” products are all free and make it even easier to unleash your creativity. Need more power? Step up to the full versions. This tier offers more functionality to help you tackle increasingly complex projects and tighter deadlines. The “Ultimate” products are the most advanced and comprehensive. With unparalleled collaboration tools, connectivity, and game-changing features, you and your team can increase productivity and accelerate your workflows. So what’s the BIG news?! 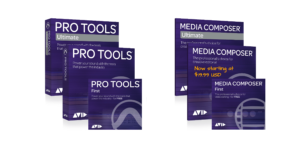 Pro Tools | HD customers will become Pro Tools | Ultimate Along with the new name, you’ll also benefit from some new options. Pro Tools and Pro Tools | First customers won’t see any chances. You’ll still be able to create, record, edit, and mix music and audio with the industry standard. Media Composer customers (version 2018.3 and earlier) become Media Composer | Ultimate Along with the new name, you’ll also see some new options. If you use Media Composer | First and would like to upgrade to Media Composer, you can do so at a new, lower price point. Also, did you know that Avid updated its versioning terminology? Now, software updates align with the year and month of release. For example, Pro Tools 2018.4, is an April release.